Home > Blog > What are the benefits of self-publishing your book? 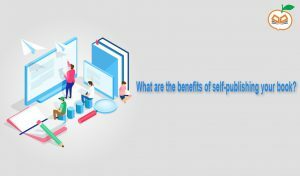 What are the benefits of self-publishing your book? Self-publishing is a fuss-free way for aspiring or budding authors to get their work published without having to use a conventional publisher. Thanks to its growing popularity, self-publishing is no longer seen as a hack for those who couldn’t make it the traditional way. On the contrary, a number of successful authors are also choosing to self-publish their titles. As a book publishers in kolkata, Orange Publishers wish to let young authors know of the advantages of self-publishing their book. So, read on to know what our experienced team has to say. That’s right, folks. Self-publishing will allow you to get your book to the market quicker than traditional publishing. In fact, theoretically, the Internet makes it possible for you to write a book today and have it published online tomorrow. However, that is definitely not a practical option and you need to have your manuscript thoroughly checked for grammatical errors and other such linguistic and literary errors. But, you get what we mean, right? The process of self-publishing is quicker than traditional methods. If you publish your book through old-school publishing companies, it can take up to 18 months for your book to be published. On the other hand, we have a response time of 7 days and get the process started within a week. Creative freedom and control is one of the biggest advantages of self-publishing. When you are publishing through traditional publication houses, you need to cater to the demands of editors, designers and marketers. However, a book publishers in india like, Orange Publishers gives you complete freedom and control over your creativity. You can rely on our support at every step of the way, but we do not curb creativity. We also provide you options on what format you wish to publish your material in. It’s your book and we might help you in polishing it, but ultimately, you get the final word. Generally, publishing houses will give you royalties on the basis of how many of your books got sold. Also, you might be only getting about 10 to 15% on each of the sold books, and the rest of the royalty goes to the publishers. But, when you self-publish your books with us, you can receive up to 70% of the profits from your book. We will also help you in not just being across all the bookstores in the city, but also sell your book through digital channels like, Amazon, Flipkart and so on. So, do you want to publish your book and include your name in the bestsellers list? Talk to Orange Publishers. We are one of the leading publishing houses in Kolkata with over a decade of experience in this sector. Our team will personalize publishing to cater to your specific needs.